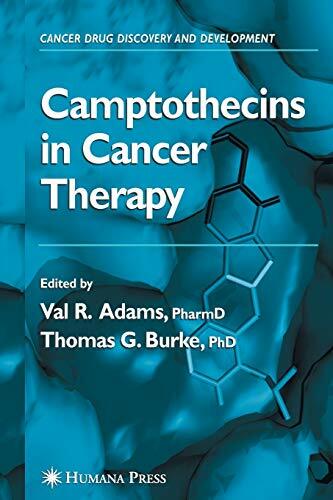 Camptothecins In Cancer Therapy: 9781588290274 Hardcover - LIMEROCK BOOKS INC.
Clinical interest in the camptothecins continues to expand even though this class of topoisomerase I inhibitors has been studied for almost 50 years, and two early generation members of the family have gained FDA approval. In Camptothecins in Cancer Therapy, leading clinicians and researchers critically review our current understanding of camptothecins, their shortcomings, and the possibilities for improving their clinical performance. The authors discuss new camptothecin analog development, drug delivery issues for optimizing their anticancer activity, and their potential use in a variety of different cancers. Additional chapters describe what is known about the biochemistry, the pharmacology, and the chemistry of the camptothecins, including the mechanism of topoisomerase and how camptothecins poison this enzyme, the use of animal models in defining the anticancer potential of camptothecins, and the question of camptothecin resistance.<br /> Authoritative and up-to-date, Camptothecins in Cancer Therapy provides a comprehensive summary of camptothecin research, as well as a much-needed guide to all the latest information on their optimal therapeutic applications.